Why not start out the week with a book review? Okay, I admit it will take us off topic, but I really enjoyed Amor Towles’ novel A Gentleman in Moscow and would like to encourage other people to read it. I remember my Russian teacher in college expounding at length on certain concepts he felt were as little appreciated in America as they were in Soviet-era Russia. But nineteenth-century Russian literature is suffused with these concepts, and he felt that we had little chance of understanding Tolstoy or Dostoyevsky unless he explained them to us. One of them was dolg, or duty. Here we are not talking about duty in the patriotic or military sense, which is a perversion of the real meaning of dolg. We are talking about the duty of every person of conscience to do what is morally right. You can imagine the students’ 1970s-era butts shifting impatiently in our hard wooden chairs as Mr. Krugovoy informed us that we Americans had no conception of what dolg means. One day, out of the blue, Mr. Krugovoy told us about a different word: nyega. It must have related to one of the stories we were reading, but I no longer remember which one. This word means “constructive idleness,” and I think that he is more correct about it than he was about dolg. The idea that idleness can be a valuable condition, that humanity cannot prosper without it — that notion is incompatible with capitalist society, just as it is incompatible with the socialism practiced in the Soviet Union. Nyega is an ideology left in the dust by the twentieth century, just as horse-drawn carriages were left in the dust by automobiles. And yet you can still find hints of it in our languages. Nyega is the root of the word nyezhnyi, which means “gentle,” which in turn is the root of the English word “gentleman.” You cannot be a gentleman without nyega, constructive idleness. Which means, of course, that in twentieth-century America or Russia, you could not be a gentleman, period. Vyshinsky: Very well, then. How do you spend your time? “Rostov” is Count Alexander Rostov, the protagonist of the novel, a member of the pre-revolutionary aristocracy (who lived on an estate called Idlehour — what a perfect choice of names!) who literally has no place in Soviet Russia. At the tribunal from which the quotation is taken, in 1922, he is sentenced to house arrest in a luxury hotel in Moscow and becomes a non-person, someone who officially does not exist. And yet, of course, he does continue to draw breath, eat meals, get his hair cut, and most of all observe the world around him. Towles’ novel is a sort of thought experiment about what such an existence means. Is he trapped in his hotel or liberated? How can you accept reality — the death of the old order — and yet not give into it? Is there a difference between resignation and reconciliation? And … can a gentleman really continue to exist in Moscow in 1922, in 1934, in 1946, in 1954? There are so many fine things about this book. I love Towles’ use of detail, which is to me reminiscent of Tolstoy, for whom there is no such thing as an insignificant character or an insignificant event. I remember recently re-reading the scene from War and Peace where Natasha Rostova is about to elope. (Natasha is the heroine of that novel, and surely the coincidence of her last name with Alexander Rostov’s is no coincidence.) The reader is waiting with bated breath to find out what is going to happen… and just at that moment, Tolstoy spends a whole page telling us the life history of the driver of the chariot she was going to elope in! In the hands of any other author, this character would be a cardboard cutout. But to Tolstoy, he is a real person, and just as deserving of his one page in the 1500-page epic as any other person. It is the way that only a writer who understood nyega could write. There is, to him, no such thing as a pointless digression. We have all the time in the world to talk about Natasha’s elopement. Time is relative; it is measured not in hours or pages but in experiences, and we must experience them fully. Or to take another example, Towles begins one of the pivotal chapters with a seemingly harmless discussion about weather — how the simple fact of rain turning to snow can change the course of history. As a reader, you’re wondering, what can this possibly have to do with our story? But then it gradually turns out that we are talking about the Count’s history, and how the fact that the rain turned to snow set in motion a whole chain of events. It’s such a beautiful and unexpected way to frame the story, in such a way that you don’t even realize when the story has begun and history is changing before your eyes. Even readers who know nothing about Russia, Russian literature, or Russian history will love the character of the Count. This is a person who is given a burden most of us can scarcely imagine, yet he never complains, never asks for pity, and never swerves from his sense of what is right. Another thing you will love is the way that the Count’s nobility inspires the other characters to discover the nobility in themselves. That is, indeed, where the other word that my former teacher loved so much — duty — enters the story. When the other characters have a choice between duty to their jobs and duty to their friend, most of them choose the latter. In spite of what Mr. Krugovoy said, conscience was alive and well in Soviet Russia (at least in Towles’ version of it). Because this is a chess blog, I have to mention that the sole exception to this rule is a shifty character called the Bishop. 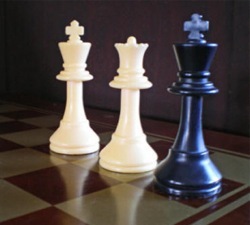 He is modeled explicitly on a chess bishop; we are told that he never asks a direct question, that he moves “only on the bias.” I am tempted to extend the chess analogy to the Count, who is indeed much like a king because he is constrained to a very small space and yet has the utmost importance to all the other pieces. There is also a queen of sorts, radiating power in all directions, and there is definitely a pawn who turns into a queen… but perhaps I am giving away too much of the story. In conclusion, let me say that it is wonderful to read a novel about Russia in the years 1922-1954 that ends with such a sense of hope. It is a little bit hard for me personally to believe that the story of the Count could have had the apparently happy ending that Towles gives it. But: this is his prerogative as an author! He believes in the conscience of ordinary people, and he believes that good will persevere. Regardless of what I might think about the plausibility of specific events in the story, that larger message is true and it is timeless. For that reason I enthusiastically and whole-heartedly recommend this book to anyone. Idleness indeed, but not necessarily a constructive one. The Russian culture of Tolstoy, of the high society XVIII-XIX century Russia isn’t that much Russian (before XVIII century), as it is French. The word and the concept and the association of “gentleman” IMHO is entirely British. I assume Towles is trying to describe a nobleman, “dvoryanin”. Because, at least to a Soviet, Sherlock Holmes and Dr. Watson, or Jerome, George and Harris were definitely gentlemen, and they do not look like “g-n Rostov”. oops, cyrillics not welcome here. Thanks for an interesting post and the book recommendation. Another one to add to my reading list! A couple of comments and random thoughts, and my apologies if I have used these examples here before (I know I have recounted some of these thoughts before in different circumstances). One of my favorite books is Nikolai Gogol’s “Dead Souls.” I know next to nothing about Russian culture of the 19th century, but my feeling is that both of these books highlight particular aspects of that culture. Gogol’s story is about the businessman Chichikov who buys up the names of deceased serfs (‘dead souls’) for tax/fraud purposes. Of course, the metaphor of the dead souls is ripe for Gogol’s musings. I wonder if there are comparisons to be made between these “paper ghosts” and Rostov’s status of living as a phantasm of sorts. Gogol also has some great details and digressions, as in Dana’s Tolstoy example. My favorite is where two high society women are disagreeing on the amount of rouge a young ingénue was wearing. One dowager asserted the girl was heavily rouged (“thick as my finger and it kept peeling off in bits like plaster”), while the other said she was “just a statue and pale as death.” Gogol then remarks, “The reader mustn’t think it strange that the two ladies were not agreed about what they had seen at one and the same moment. There are, indeed, many things in the world which have the property of appearing to be absolutely white when one lady looks at them, and as red as a cranberry when another lady looks at them.” How wonderful is this? It seems as though most languages have words like dolg or nyega that encapsulate specific cultural concepts that can only be described in other languages with a whole lot of words. The German gemutlichkeit is one of these words, as is the Danish hygge. One of my favorites is the Catalan enyoranca, which roughly translates for a nostalgic longing for the hearth, which of course may or may not have every truly existed. First, Nyzhnyk is a Ukrainian last name, not Russian, but I am inclined to see its roots in the word “nizhnij” or “niz” which means ‘lower’ or ‘bottom’. Nothing to do with ‘Nega’.